AUSTIN, Texas, December 14, 2010 (ENS) – From now on, Texas officials and coastal managers will receive early notice of red tides and other toxic algae outbreaks that could threaten public health and affect beach and fishing activities along the coast. Currently, there is currently no indication of a harmful algal bloom along the Texas coast, or in Florida, the other coastal region where managers receive notice of harmful algal blooms. But when the algae do bloom, typically in late summer, managers will learn about them earlier than they have in the past. Weekly bulletins generated by the Harmful Algal Bloom Operational Forecast System run by the National Oceanic and Atmospheric Administration, NOAA, are based on observations from state partners, coupled with models, imagery and data from NOAA’s powerful tide and current and weather systems. “Early notification of blooms is essential, and knowing that a bloom is occurring offshore provides our resource managers with sufficient time to coordinate with other responding agencies and formulate a plan before blooms hit the beaches,” said Meredith Byrd, harmful algal bloom response coordinator for the Texas Parks and Wildlife Department. NOAA has had an operational forecast in the eastern Gulf of Mexico for harmful algal blooms off the Florida coast since 2004 and now, with the expansion of the operational system, analysts will be available to review conditions daily with coastal managers from all of the Gulf of Mexico states. 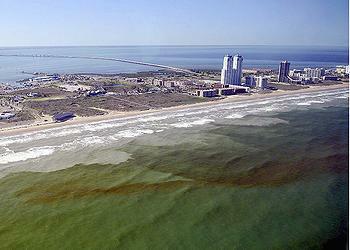 The most common harmful algal bloom that occurs in the Gulf of Mexico is known as red tide and is caused by the algal species Karenia brevis. Red tides have resulted in fish and marine mammal deaths, shellfish contamination and human health risk in the form of respiratory distress. NOAA says the economic impacts of harmful algal blooms in the United States average $75 million annually, including impacts on public health costs, commercial fishing closures, recreation and tourism losses and management and monitoring costs. Recognizing the need to provide harmful algal bloom information on a more consistent basis, NOAA worked to transform this former demonstration project into an operational system. Earlier this year, test bulletins of the system successfully tracked and informed Texas officials about the location of a harmful Dinophysis algal bloom that closed Texas’ shellfisheries. “Ecological forecasting is crucial to protecting human health, the nation’s economy and our enjoyment of our special coastal places,” said Richard Edwing, director of NOAA’s Center for Operational and Oceanographic Products and Services, or CO-OPS, which provides water-level and ocean current measurements. “This new system is another way NOAA helps equip our coastal managers with information and tools to plan for and recover from the costly affects harmful algal blooms cause to their communities,” Edwing said. The NOAA Harmful Algal Bloom Operational Forecast System is operated by NOAA’s CO-OPS, in partnership with NOAA’s National Centers for Coastal Ocean Science. Operational forecasts are also available for most of Florida and are in various stages of testing in other parts of the nation. To access the system, visit: http://www.co-ops.nos.noaa.gov/hab. Harmful Algal Bloom conditions reports, including potential impacts for the next 3-4 days, are posted to this website twice a week after confirmation of a bloom, and once weekly during the inactive season. Additional bloom analysis is included in the HAB Bulletin that is provided to state and local coastal resource managers in the region.